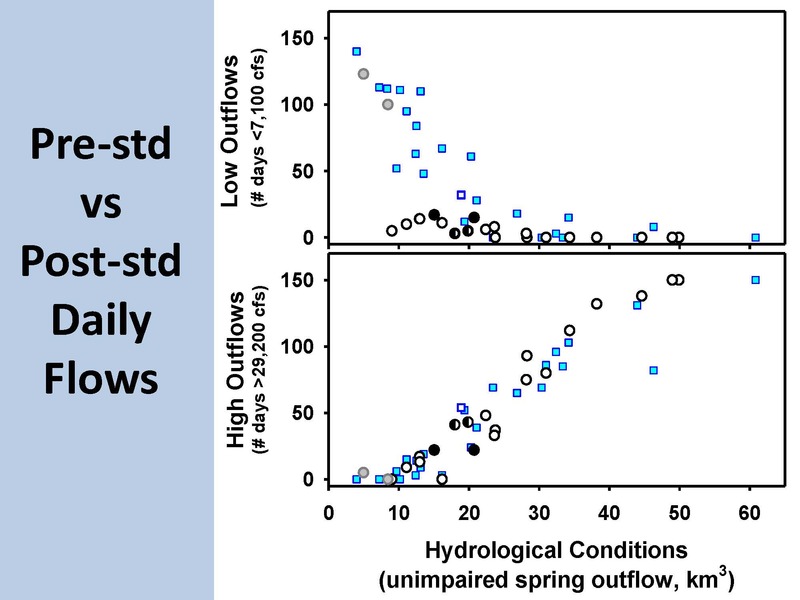 Dr. Tina Swanson gives her analysis of the standard; has it really resulted in increased Delta outflow? Fresh water flowing into the Delta is highly contested and tightly managed. 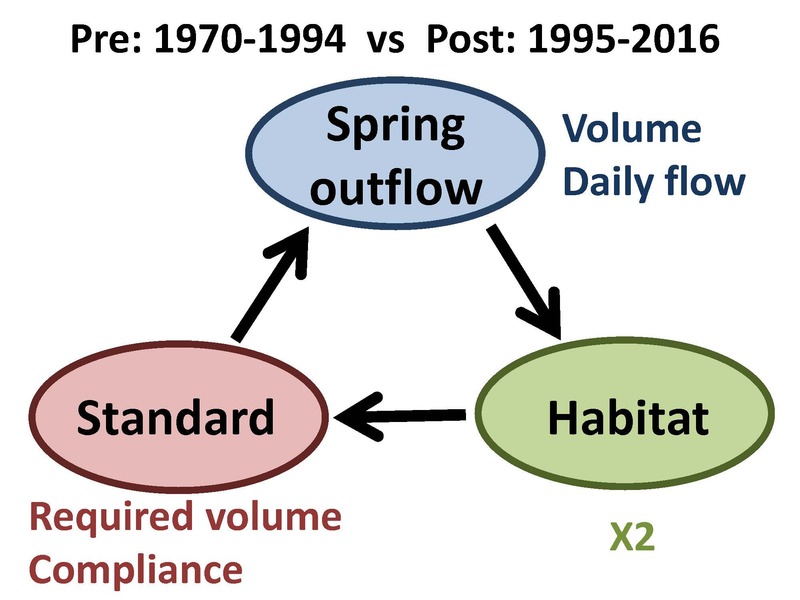 The current regulations for spring outflows were established in 1995, following a severe multi-year drought, lawsuits, fish population declines and several Endangered Species Act listings. 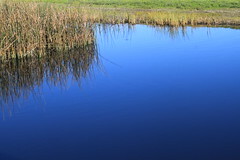 These new standards were designed to provide outflows to the San Francisco Bay that reflect variation in hydrological conditions, prevent extreme low inflows, and improve low salinity habitat. 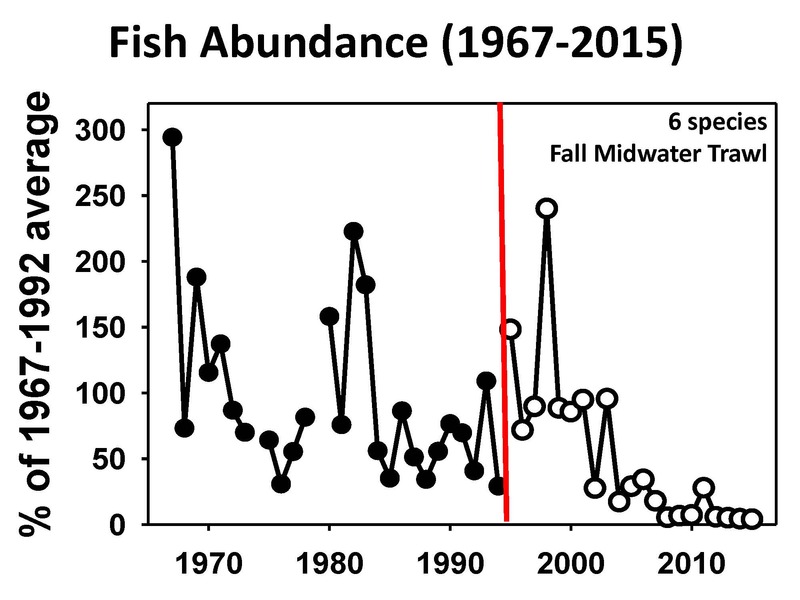 However, since then, fish populations have continued to decline. 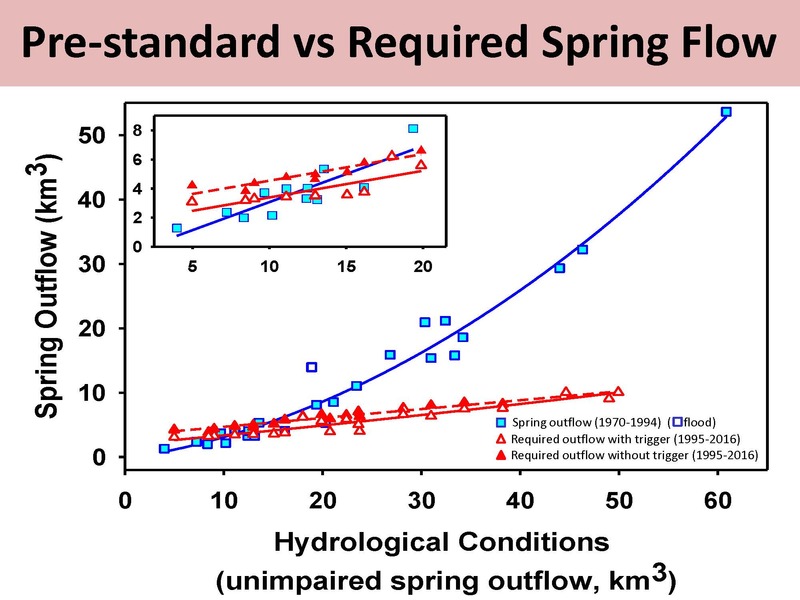 So how effective has the 1995 spring outflow standards been in achieving its objectives? 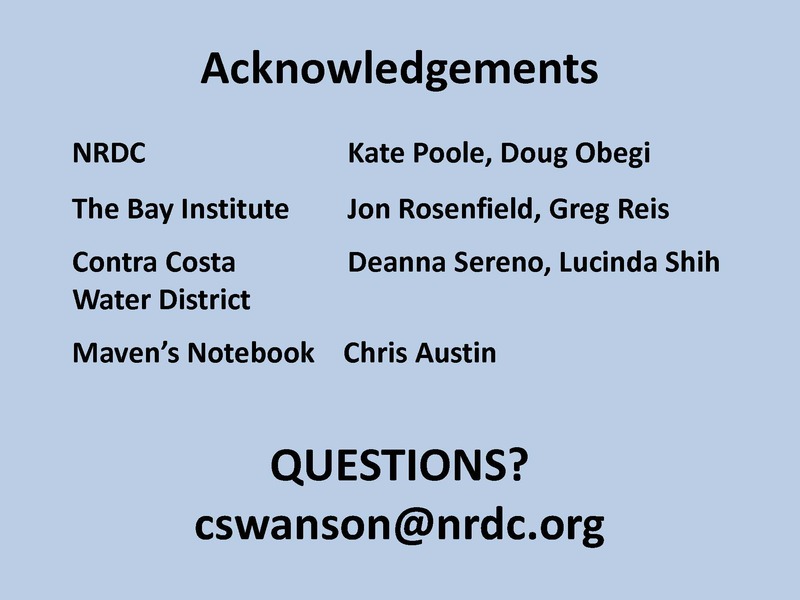 Dr. Christina Swanson, Director of the NRDC’s science center, gave this presentation at the Bay Delta Science Conference of her analysis the implementation of the standards established more than 20 years ago and their effect on seasonal flow amounts and low salinity habitat in the Delta. 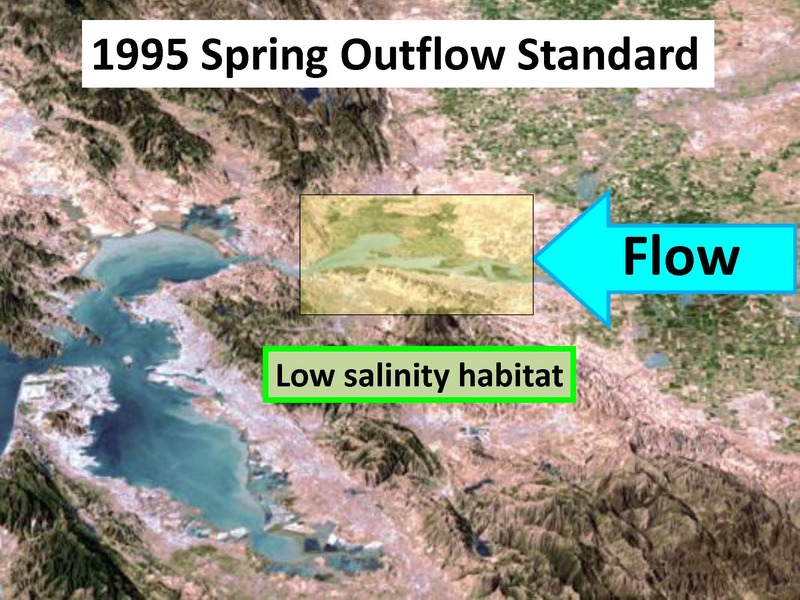 The spring outflow standard element of the 1995 plan was put in place specifically to regulate outflows from the Delta into the estuary for the purpose of protecting and improving low salinity estuarine habitat and improving the conditions for fish and wildlife. 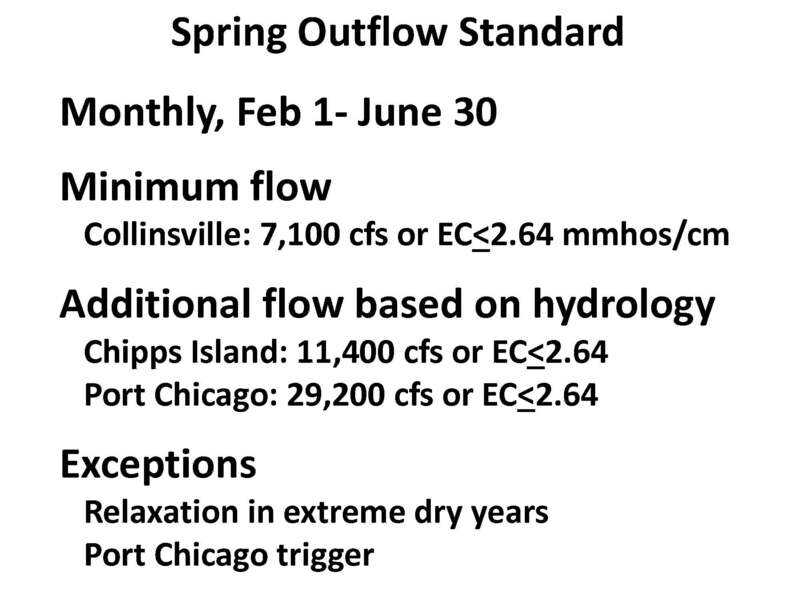 The spring outflow standard had a number objectives, one of which was to prevent the extreme low flows that had occurred during the drought period in the early 1990s. In order to determine what the standard is, you need to know what the 8-station index is, and then consult a table contained within the State Water Board water quality control plan document to figure out the number of days for each of these different flow levels that are required, she said. “This has prompted a number of stakeholders in the system to suggest that it really is an indication that the flow really isn’t important to these fish, since the spring outflow standard hasn’t provided the benefits that it was supposed to, and since it neither really protected the fish nor recovered them, maybe there really is no relationship with flow,” she said. 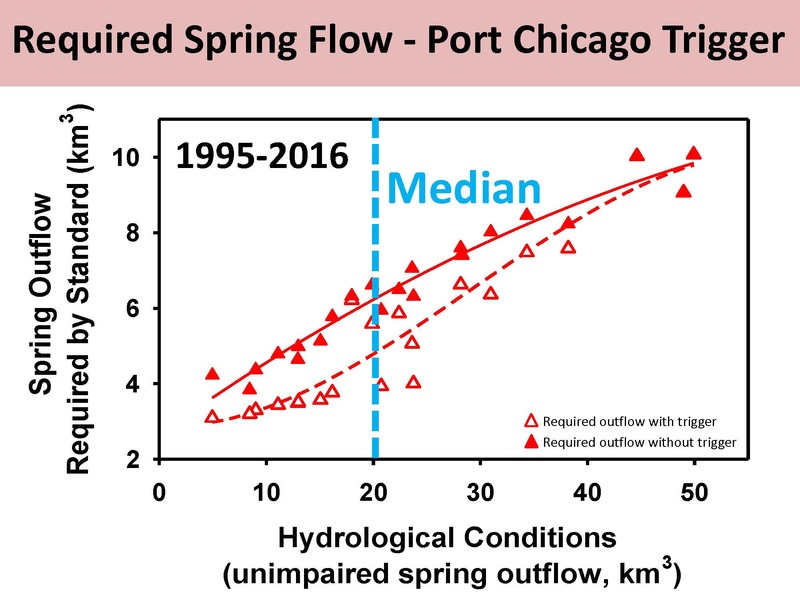 “This is a really appropriate question to ask and is particularly appropriate as a talk for this conference because in fact, I’m going to argue that the 1995 water quality standards and in particular, the spring outflow standard, was and is an exercise in adaptive management,” said Dr. Swanson. 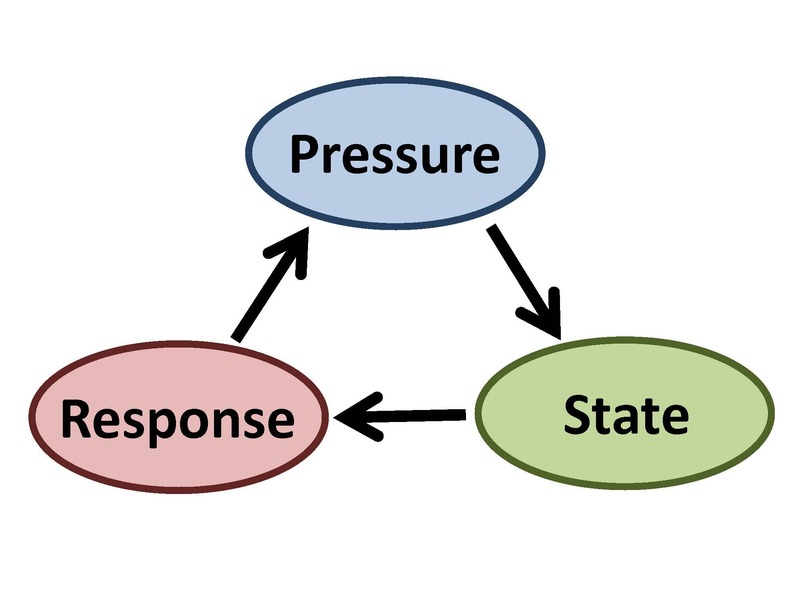 So how do the minimum required flows for the post-standard period compare to the actual flows that occurred during the pre-standard period? 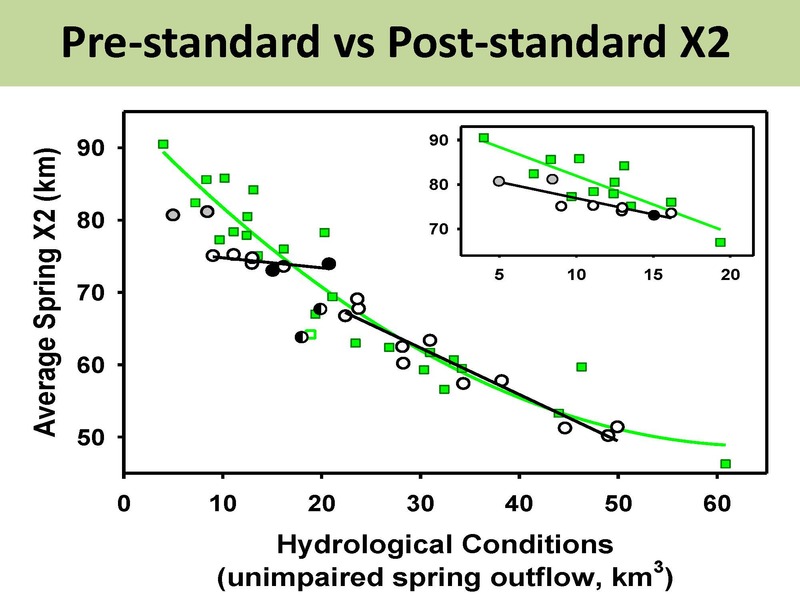 She presented a slide showing the comparison, noting that the amount of flow that occurred during the pre-standard period is shown in blue. 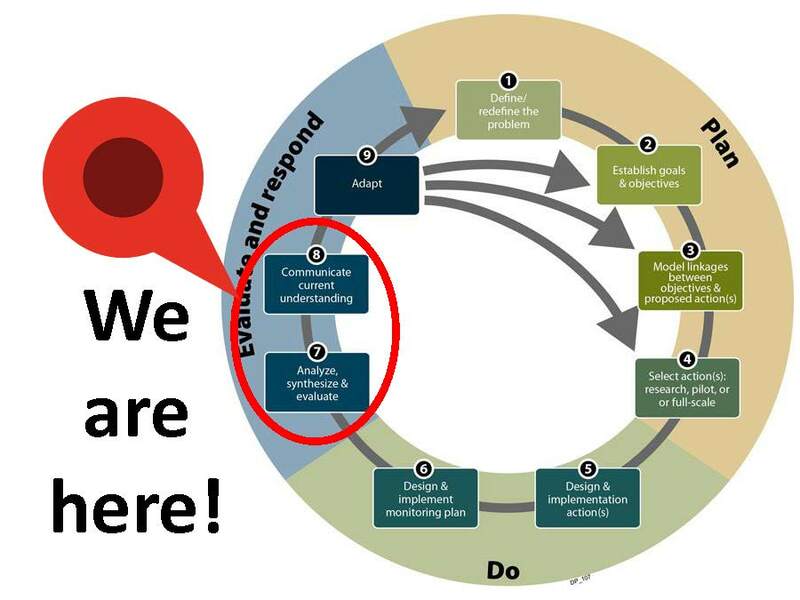 How has the standard been implemented? 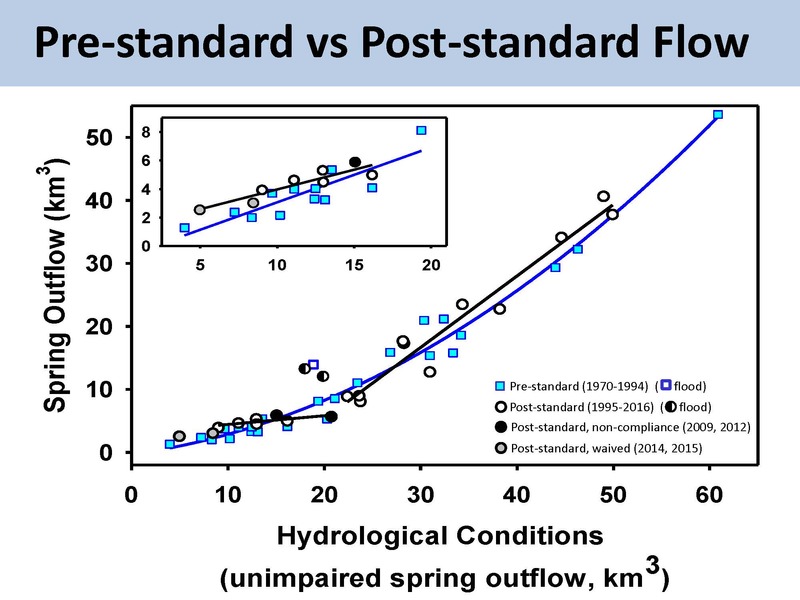 For the 22-year period the standard has been in place, it was waived in the driest two years, and in the remaining 20 years, based on the data examined for flows and EC, it was fully complied with in 18 of those 20 years. “It was not complied with in two years, 2009 and 2012. In those years, they missed at least one day of one of those other flow standards. 2009 was the more extreme one. So in fact, the standard has only been in effect for 82% of the years,” Dr. Swanson said.